The kitchen staff prepares meals at Le Politique in downtown Austin. The problems restaurants face might have a familiar ring to them: affordability, competition and rising costs. “We tend to be in nice locations, and in those locations you’ve had a lot of gentrification and increased property values over the last 10 years,” says Delfo Trombetta, president of the restaurant management group New Waterloo Hospitality. "A lot of our [employees in] lower-paid positions just can’t afford to live near" work. These entry-level employees have other options, too. 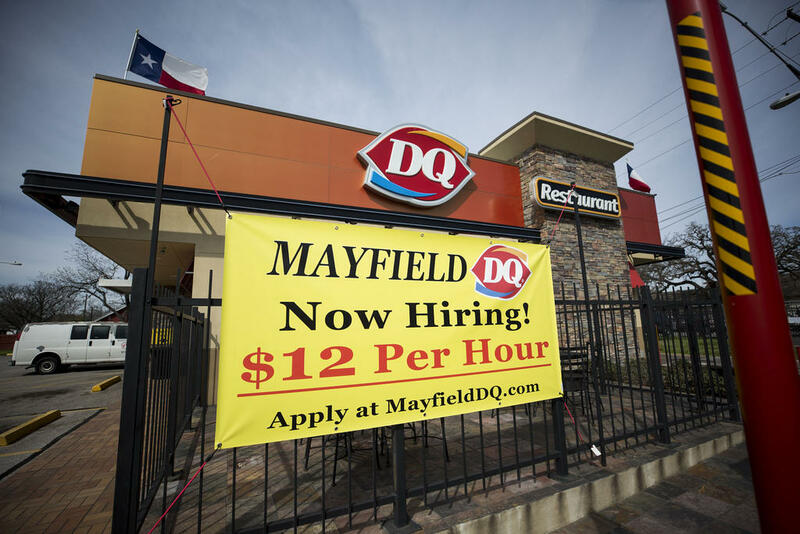 “Our labor market includes places like HEB and stuff like that, so we try to stay on top of what everyone else is doing,” says Robert Mayfield, owner of Mayfield Dairy Queen. And restaurants face the same expenses many Austinites face: property taxes, rent, food costs. “Whether you’ve worked in restaurants or not, you’ve heard that restaurants are difficult, and they don’t make very much money, and the margins are low,” Trombetta says. "Those are all true." Increasing labor costs by just a few percentage points can take a big chunk of your profits, he says. New Waterloo manages about 1,000 employees at some pretty swanky spots: Sway, La Condesa, Le Politique and the South Congress Hotel to name a few. It has tried to attack the problem by offering higher pay. Anecdotally, he says, he’s heard of dishwasher applicants leaving interviews as soon as they find out the starting pay. Trombetta says the company has contemplated transportation and parking solutions to help employees – like a shuttle van – but for now, considers them impractical. While they serve a different level of cuisine, fast-food joints are in a similar bind. Mayfield took over the Austin-area Dairy Queens from his parents 40 years ago. His DQ locations have several things in common: Blizzards, Hunger Busters and banners offering some fairly high wages for fast-food employees. Robert Mayfield, the owner of Mayfield Dairy Queen, says he tries to limit employee turnover by offering incentives beyond the relatively high wages for a fast-food restaurant. Mayfield says the turnover rate at his nine restaurants was higher than normal last year, at 39 percent. But that's well below the industry rate of 72 percent in 2017, according to the U.S. Bureau of Labor Statistics. He says he’s able to limit turnover by offering other incentives. Katie Congdon, CEO of Dan’s Hamburgers, says those extras go a long way toward retention. She says Dan’s pays 70 percent of employees’ health insurance. It offers life and dental insurance, along with cash Christmas bonuses. "They are like family to me, as many are close to my age, and I have a long working relationship with [them],” she says in an email. Despite offering benefits and paid vacation, she says, she has found it harder to add to Dan’s staff. Besserman says this is not just an Austin problem. West Texas restaurants near the Permian Basin struggle with competition from oil companies, which pay much higher wages. In a tight job market, he says, you’ve got to offer more to compete. The good news is this means entry-level workers are making more money. Other employers have to adjust lower wages up to the market, creating more jobs that pay more. The downside for some restaurant owners is that already-thin profit margins may not allow them to lure better employees. In the long run, that will make it harder for them to stay in the game.